Provides a framework that focuses on learning and development for the 4 year old child. Focuses on the five essential developmental domains. Includes a Sample Instructional Unit and Instructional Unit Template. 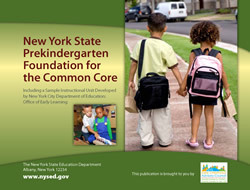 Print, spiral-bound copies of the Pre-K Foundation for the Common Core are availbale for purchase either online or through our mail-in order form. Prices vary depending on how many books you order, so be sure to select the correct item and price point on either the online or mail-in order form. Shipping and Handling Included, For all orders, please allow 5-10 business days for processing and shipment. Online credit card payments are processed by Research Foundation's "Event Payment" application. On the order form page, be sure to select the Pre-K Foundation for the Common Core at the correct price point for your order size ("1-19" or "20 or more") Once you have selected the book at the desired price point, you will be able to set the exact quantity you would like to order. For online orders, please note that a minimal payment processing fee will apply. Use the mail-in order form if you'd prefer to pay by check, money order or purchase order. Simply print the order form, fill it out, and include payment.